This is a print Wallis tunic top. Size 16 Petite. Jersey fabric. This top has been worn. 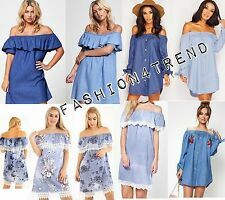 Lovely, blue, chambray tunic shirt top from NEXT. Size 18 Petite. Cotton with a Linen feel / look. Pleats to the front. Elastic at scoop neck with short sleeves pit to pit 16". White Stuff Navy Floral Tunic, Size 8. Very Good Used Condition. New listingNew Look Petite Cotton Black/white Gingham Check Tunic Top. Size 8. New Look Petite Cotton Black/white Gingham Check Tunic Top. 3/4 sleeves with ties to cuff. Has embroidered floral detail. Size 8. In good used condition. SIZE 8 FAT FACE TOP IN A LOVELY BURNT ORANGE/TEAL/NAVY & cream aztec PRINT(SEE photo 7 for close up of the print. & colours),WITH SHORT SLEEVES( photo 8)BRONZE LOOK,BUTTONS ALL THE WAY DOWN (Photo 6)Photo 4 shows the neckline With pleats round it.5 shows a closer look Approx measurements..49cms wide under the arms stretches to at least 58cms.68cms long from top back to hem. ITS very stretchy ITS IN VGC.I have quite a few items listed on eBay. If you want to buy something else I'll combine the postage if you let me know. Dorothy Perkins Navy Top Size 16. Dispatched with Royal Mail Signed For® 2nd Class. • Gap Small Tunic Top. • Machine washable. • Slight bobbling. • Light weight. • Pockets at front. Nice light weight tunic. Can be dressed up or down. Fab colour. Size 10 Petite. Cotton/Silk mix. I'm having a bit of a clear out. Machine Washable. Light Weight. By: Next Petite. Colour: Red White Blue. Stretch Fabric Detail. Fair Used Condition, starting to show signs of flocking from wash and wear now. Back of Neck to Hem Approx 22". PRINCIPLES PETITE. BLUE PRINT COTTON TUNIC TOP. SIZE 14. PRINCIPLES PETITE. BLUE PRINT COTTON TUNIC TOP WITH CONCEALED ZIP AT THE SIDE SEAM. SIZE 14 PETITE LENGTH 30" PIT TO PIT 20". White fine knit marl material. Has a top layer floral lace panel down the centre front and around the hemline. Scoop neckline, with cut out detail. Loose fit to the hem. Long sleeves. Size on the label says Petite XL. Lovely Petite Next Tunic Dress. Size 12.. only uk bids thank you. new without tags.. was £28 pounds.. 2nd class singed for Thank you ..
Can’t capture colour very well - it’s denim marl blue, not as bright as photos. Back length 27”. Cotton blend. Cotton Long top / tunic. by NEXT Petite. 100% Cotton. 72cm full length. Size 12 uk petite. Pretty beige sleeveless top. length 25". COLOUR BLUE. JUST SLIP OVER THE HEAD STYLE. ELASTICATED STYLE AT THE BOTTOM. LACE STYLE TRIM ON THE FRONT. SIZE: SIZING LABEL STATES 10 PETITE. IN GOOD USED CONDITION. 3% Spandex. 74% Cotton. Length: approx. Lovely button front tunic style top byM&Co. White with a multi coloured floral print. Good condition. John rocha tunic, petite 14 pretty design. Dispatched with Royal Mail 2nd Class. Size 10 petite black dress/tunic top BNWT. Condition is New with tags. Dispatched with Royal Mail 2nd Class. Lovely thin backless black sundress. Tie straps and zip to the back. 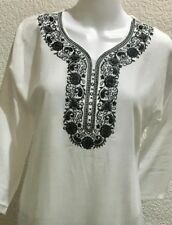 M&S Indido Collecti Indigo Collection Sz 8 Embroidered Long Top With Sht Sleeves Condition is Used. Dispatched with Royal Mail 2nd Class. ASOS petite grey flared jersey T-shirt. BNWT. Size UK 4. TALBOTS PETITES BLOUSE. NEW. Teal cotton, tunic style, waist tie, long sleeve. TALBOTS PETITES BLOUSE. Collarless tunic-style blouse in teal self-stripe 100% cotton. Features seven button front fastening, shaped hem, waist tie, rear yoke, front pocket & elasticated cuff sleeves.